All Winter Trips Posted Via Email. There's just no use trying to go everyday in winter. Life Goes On..
Saturday - Feb 6th - 4AM to 4PM -- $170.00 -- 16 Sells Out -- Long Paddle - Slow Boat - Long Long Tog.. Reservations Required. If you like short runs with lots of fishing time, this trip will be the exact opposite of that. Going Toggin Anyway! Tog Only, Sea Bass Are Closed Because NOAA Has Absolutely No Real Idea How Best To Manage The Fishery. Now Out Of Block - Rats! Working On More.. Will Accept Even Small Donations Of A Few Blocks You Have Cluttering Up The Yard..
Last Thursday started dead slow. Really dead. After that big blow dead. The wreck I was on, and I very rarely discuss such since the invention of the internet, didn't seem right. I kept dropping back wanting to work a ledge that I'd fished for 36 years now..
After I pulled anchors to go try another spot I discovered that ledge is no more. It had collapsed in the gales of that blizzard a week before. 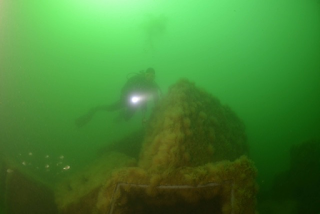 The top of the wreck, the African Queen, had been just 27 feet down in 72 feet of water, now it's 40 feet down at it's highest peak. A very bad storm for an aging shipwreck. Probably a really, really bad day for a lot of tog too. I expect Mother Nature was over her limit.. Turned the day's fishing around by heading offshore. Using the secret gaaradjski technique, a Russian friend released two very nice fish with tags. A number of limits around the rail and more great releases were offset by two skunks - happens. Saturday the current was dead. Nicked a few and concocted a grand plan to put a spark in the day - except our bucktoothed quarry would have none of it. Really tough day - high man had 2. Sunday was a nice day. Problem was I'd cancelled looking at wind forecasts with a lot of 20.. Weather's pretty simple: Go broke if you listen, Die if you don't. Still, and this time of year especially, I have clients driving even 5 hours to fish & then drive home. I really try to avoid sending people home in the morning without having gone fishing. Sometimes the best intentions just don't work. Friend to all of Maryland's recreational fisheries, CCA's Dave Sikorsky, MARI Treasurer Ed Liccione, Rick Elyar, & I worked with a team of scientists from The Nature Conservancy to write a grant proposal for sea bass habitat restoration & study off the coast. I've written a fair number of proposals--small time stuff. Even succeeded in getting some funded. I've also read a lot of grant proposals - studied them even. But, Sweet Peaches In The Biscuit Batter! Man, I have NEVER seen anything like this.. Amazing. We fishers contributed a lot: history/cause/successes in reef/failures/materials; stuff from experience. But one gal with TNC especially, Kate; (and I hope you read about her often in these reports,) she created a masterwork. I watched the art of grant-writing bring our thoughts & ideas to life - turn fisherman's gut feelings into scientific hypothesis & plan. Deeper still, the TNC team turned our experience with MARI & CCA into a real 'monitoring plan.' It's what we were doing, plus more, that should turn it into hard science. If the Maryland Artificial Reef Initiative (MARI) & OCRF had hired this work done; why, I can't imagine - $15 or $20K? Just to write what we have so far? I don't know, but it's good stuff. That doesn't mean it'll get funded. Lots of other proposals coming in too. All of them would likely advance our knowledge of sea bass & habitat. We have concrete dating back to the Romans - but it ain't natural. Lot of folks have a hard time with 'ain't natural' substrates going in the ocean. You should see the MAMMOTH pipes they're going to use for a new water tower in West OC. Biggest plastic pipes I've ever seen - they'll connect to just regular-sized huge plastic pipes - then connect to plastic neighborhood supply lines, with plastic household lines finally branching off to every sink and shower. Everyone involved: politicians/architects/manufacturers/workers - they'll all drink from plastic water bottles while bringing the new water main to life. There's no possible way I could permit a plastic artificial reef though -- no matter how well ballasted & engineered. Worlds a strange place. We're going to have big trouble with plastic before it's over - especially plastic trash in the ocean. Plastic doesn't 'biodegrade,' it photodegrades. In other words, it remains 'plastic' no matter how small the sun's heat/radiation cooks the particles down to. There's going to be trouble, that's for sure. We'll hear more about "epi-genetic mutation" before too long.. But, back down at the seafloor, if we can convince management of it, I think we really are best-off building rock reefs - concrete too. Heavy steel, like a barge or military tank, will work also, and for a long time; but rock's better.. A "forever reef" (so long as you don't count plate tectonics) . . . I've spent a bunch of years now trying to get our seafloor habitat on NOAA's radar. Recently I started reading an article by BOEM about fish habitat along the East Coast & in the MD Wind Energy Area too. Their research 'discovered' croaker, spot, weakfish, & sea robins roughly 12 to 20 miles out off Maryland. Big .guv's got complete access to an absolutely perfect picture of the bottom, even sub-bottom, and we ain't got a lobster or sea bass nowhere off here? Not even a flounder? BOEM writes: "...the MD Wind Energy Area (WEA) benthic habitats are heavily dominated by mobile sandy bottoms although patchy hardbottom cannot be entirely ruled out."(so.. with millions & millions of dollars in sonar surveys they haven't found rocks I can easily locate with my used $100.00 Furuno sounder? Rocks I told them were there anyway?) "The most prominent fish encountered was sea robins, however, the report notes that this is not entirely consistent with previous fishery independent and fishery dependant data which had far more Atlantic croaker, spot & weakfish." Yup. According to BOEM: No Reef, No Reef Fish, & No Fish Impacts From Sub-Bottom Profilers. My work these last couple decades: Advocacy Fail. I'm confident a super-quick bioeconomic study from Vessel Trip Reports (VTRs) in, and immediately adjacent to, the MD WEA would have shown sea bass & lobster as economic drivers. Think my clients nick a few flounder in there too..
Derned if I get it. Find a single coral underneath a ledge in 100 fathoms & you have CORAL! Look World!! WOW!!! So: In the same week a failure to express a true picture of the bottom in and around the MD WEA was published; the world's largest environmental .org -TNC- put into scientific language the beginnings of a plan to restore a Mid-Atlantic hardbottom reef. Almost like having record snowfall & record high temps in a 7 day period..